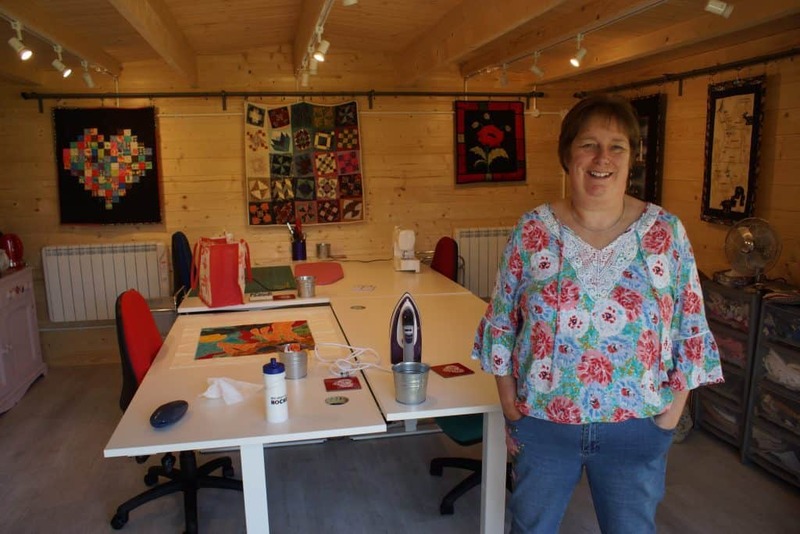 BlogHome » Our new Quilt Studio is open – Alison shares her excitement! Last Autumn I realised that I had a serious case of studio envy having seen several friends in the village create their own space in which to pursue their creative interests. I idly googled the cost of garden studios and discovered they were cheaper than I had imagined. We’ve been running quilt retreats since 2013 but we have always been conscious that we were adapting our dining room into a temporary studio. How much better if we could have a purpose built space. 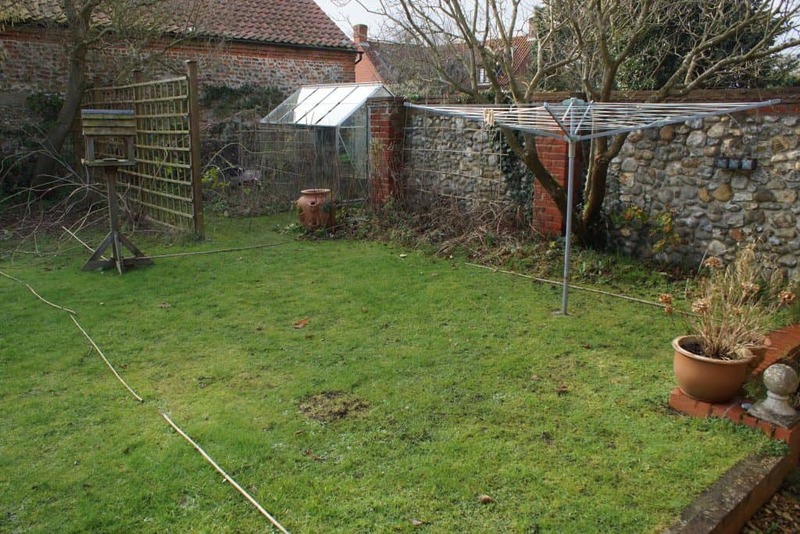 There was an obvious spot in the garden where a studio would fit without dominating the rest of the garden. 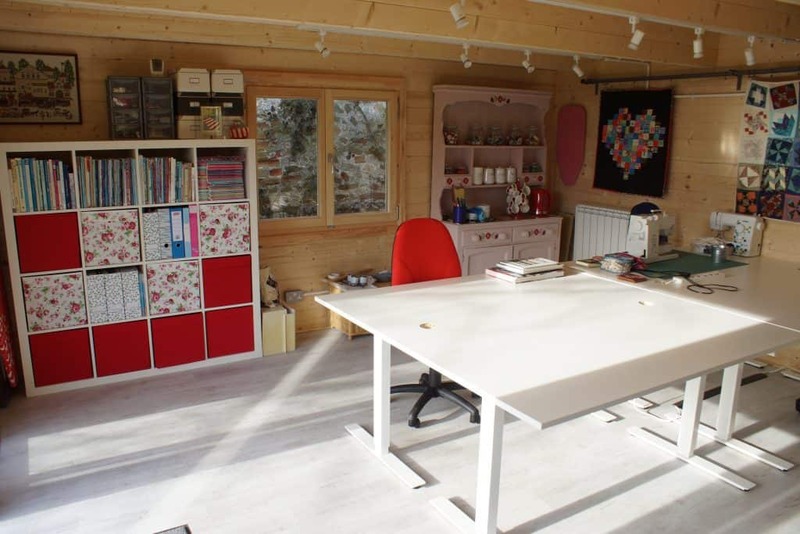 The next task was to convince Mike that building a quilt studio was a good idea, particularly as his greenhouse was on the site I had in mind. That was surprisingly easy; I think the thought of all the loose threads, that trail throughout the house after a retreat, remaining in a studio was the clincher. 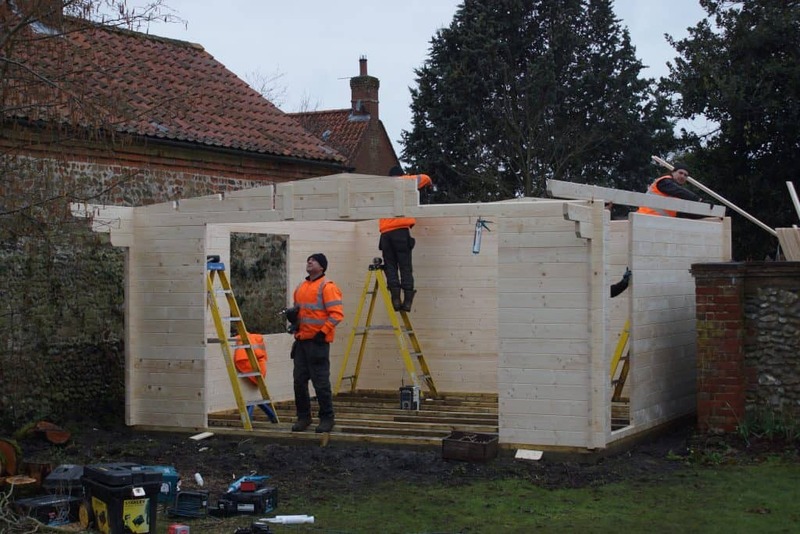 We researched lots of types of garden buildings and finally chose a local Norfolk company (Scotts Sheds) to build a 25 square metre wooden cabin. Our builder constructed a reinforced concrete slab; this was slightly fraught as it was originally scheduled for early one Monday morning in late February. 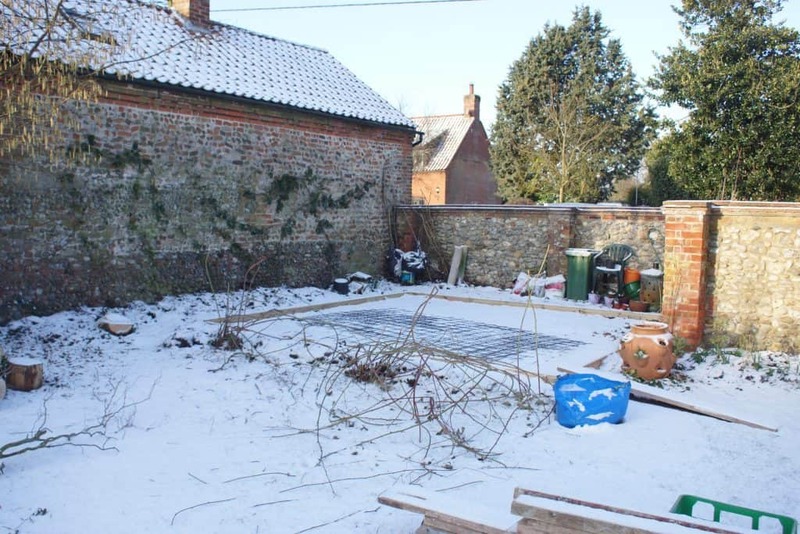 When we woke up it was snowing and we had to urgently postpone the delivery of the concrete as it was too cold for it to set. 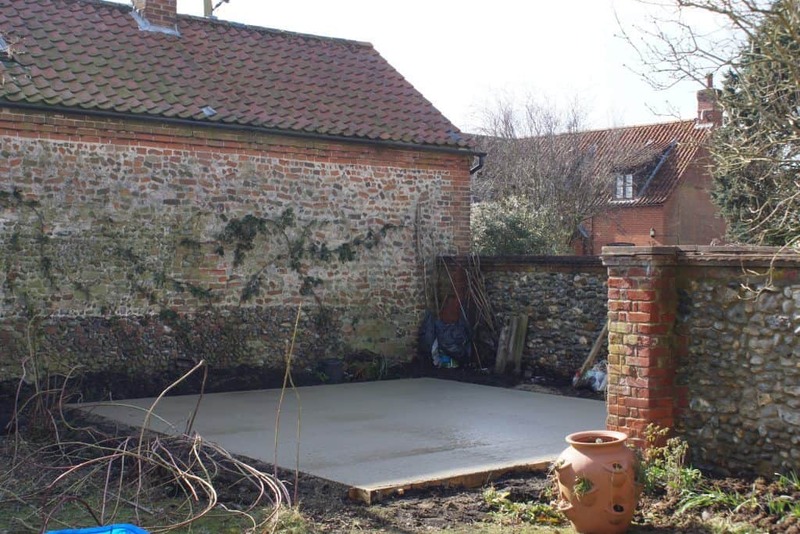 Finally the weather warmed up, the slab went down and a week late the studio was erected in one day. 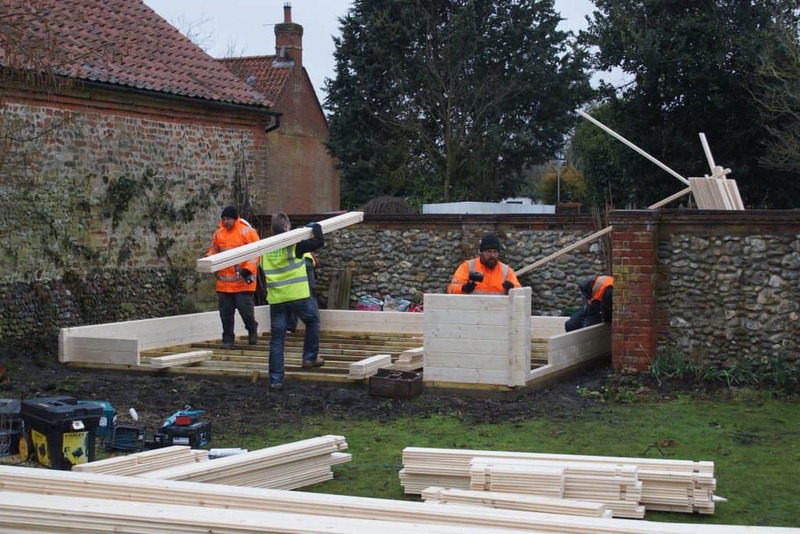 I was on a training course as it was being erected and Mike kindly sent me photos which I checked at every break. 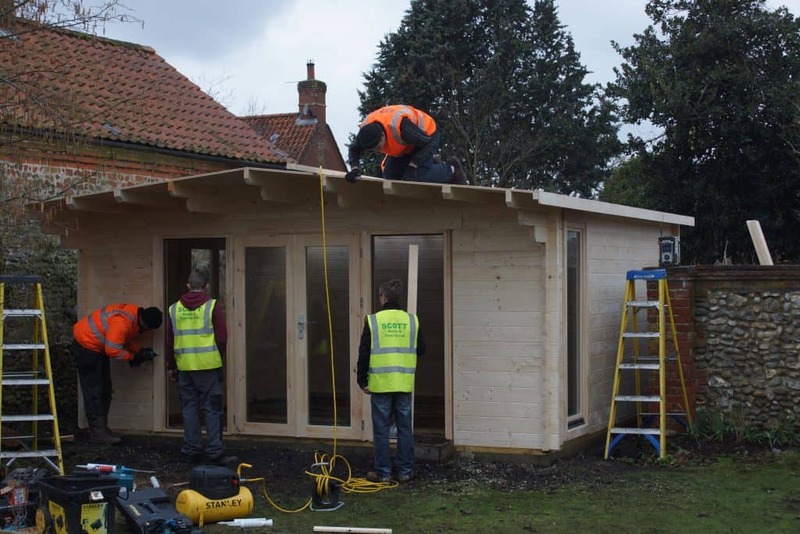 Although the last one was not of the completed studio but all the builders sitting out in the garden drinking tea! Our local electrician then fitted the studio out with power, lighting and heating. Then it was my chance to start equipping the studio. 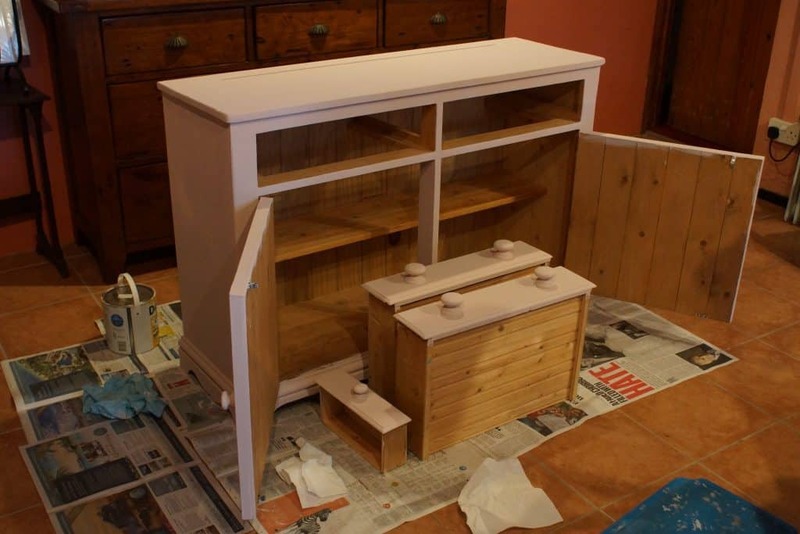 Earlier in the year Mike had bought a dresser at the weekly auction in Fakenham. A bargain at just £20; I’ve spent more than that on paint, stencils, wax and oil-cloth but it was worth it. We took advice from the quilters who visited last Autumn about what they liked in other places that host quilt retreats. We’ve tried to incorporate all of these ideas in our new studio. The desks are ‘sit/stand’ desks. This means that the height can be adjusted by a simple handle. The desks are 1.6m x 0.8m which gives lots of work-space. The height of the seats, as well as the seat backs, are also adjustable. That means that everyone can work comfortably and not end up with back-ache. 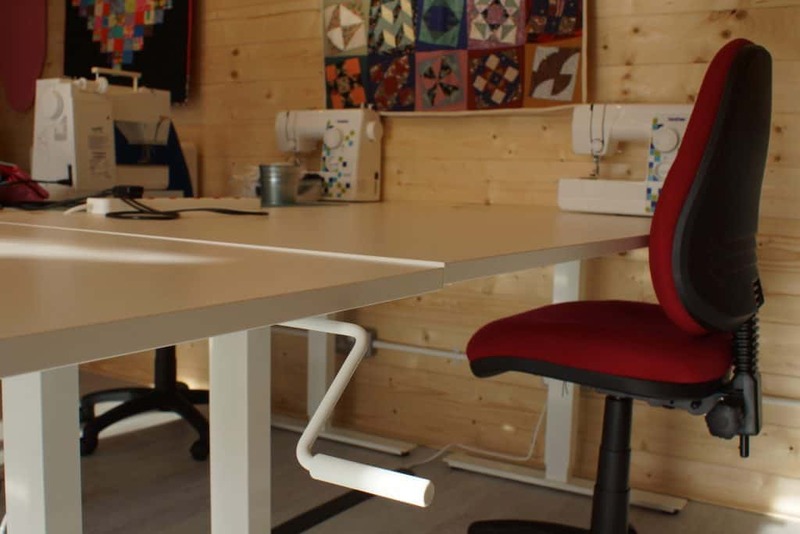 Each work-station has a trolley on wheels where quilters can put all their tools and spare fabric. We have put up two sets of double rails that I can hang my quilts from and also hang sheets from the front rail to create temporary ‘design walls’. 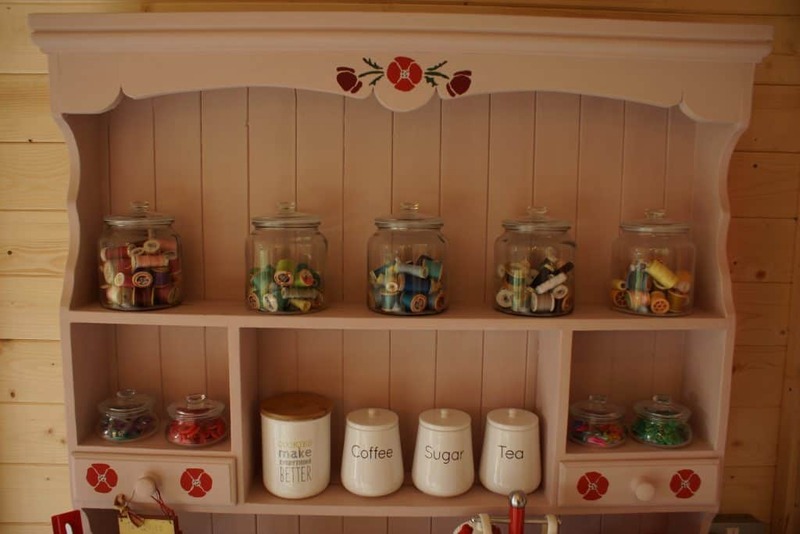 The dresser has all the refreshments that quilters can help themselves to. 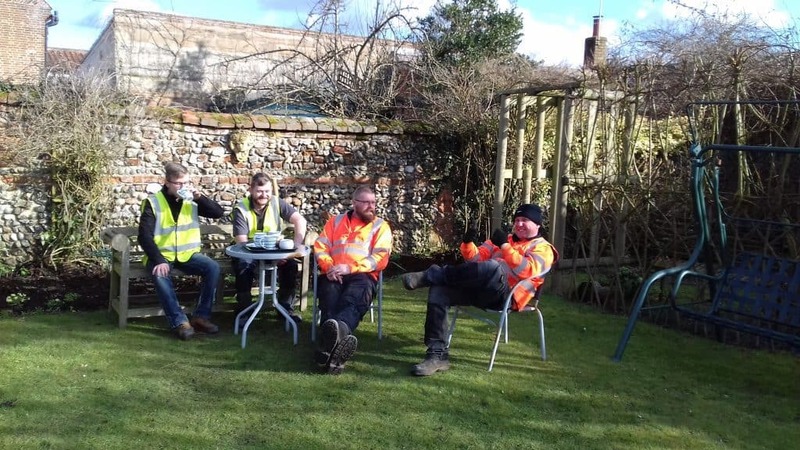 We also supply tea, coffee and home-made cake for elevenses and mid-afternoon. Our first quilters were blessed with the hottest days of the year so far. 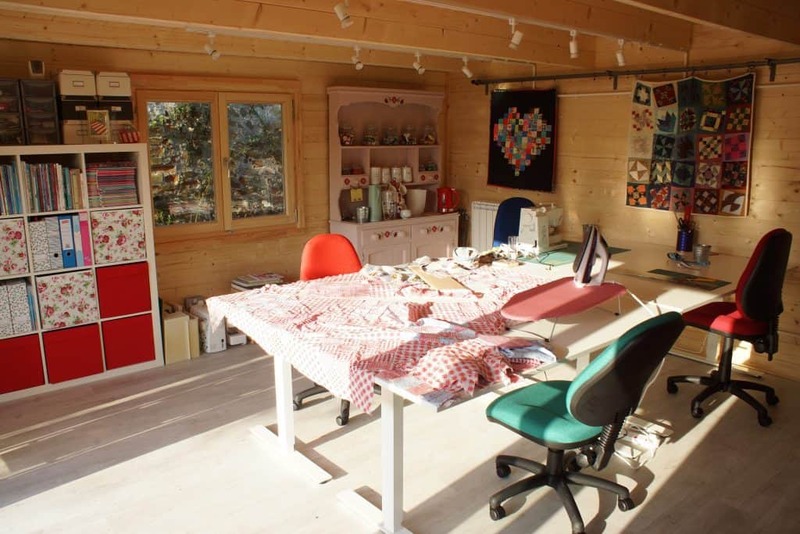 The doors of the studio were flung open wide and they were able to sit and sew in the cool of the studio whilst they listened to all the birds singing in the garden. Bliss! After they left I spread out a few of the projects that I had discovered when moving all my fabric into the studio. These two go back to 2008. One is a quilt to celebrate our Silver Wedding Anniversary. I need to finish it before September when it is our 35th wedding anniversary! 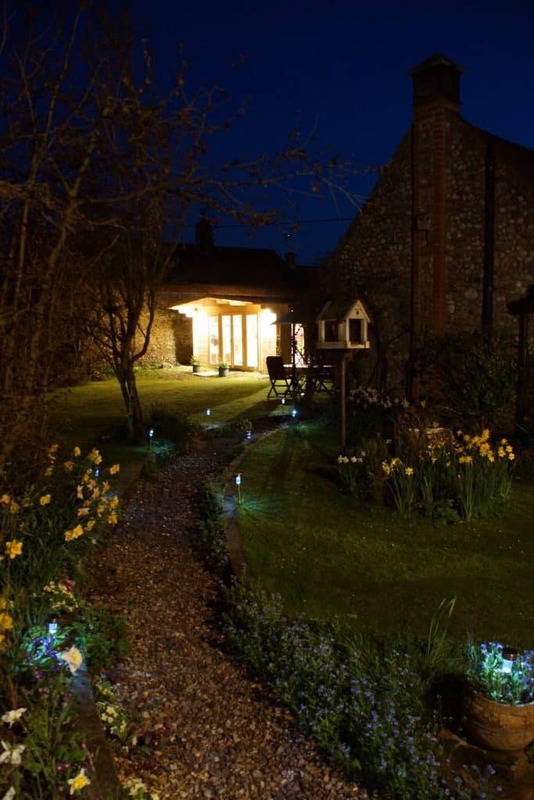 We’ve added lights on the path towards the studio. Now you’ll know where to fine me! Click here for more information on our quilt retreats.